48-year-old man with chest pain, nausea, and diaphoresis. Rhythm: progressive lengthening of the PR intervals, until a P wave is dropped 2° AV block, Type I (Wenckebach). Ischemia/Infarction: broad T waves in inferior leads (II, III, aVF) which begin at the J point of the QRS and seem to be “tugging” the ST-segment upwardà these broad and tall T waves are early, hyperacute T waves of transmural infarction. 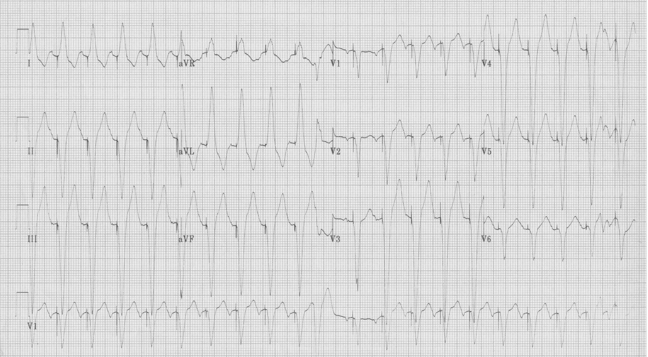 There are also “reciprocal changes” in V2-3 with ST-segment depression and T-wave inversion. These changes often represent infarction of the posterior wall. 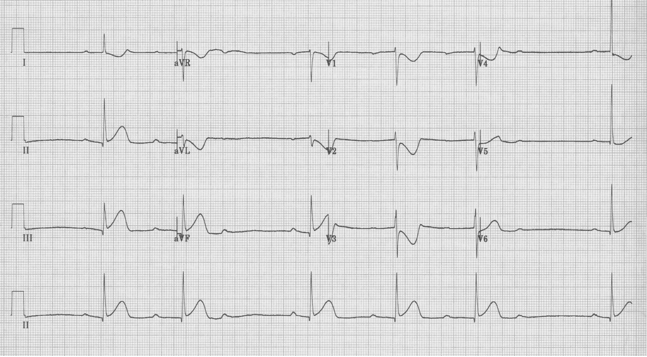 Interpretation: This EKG represents an acute inferior-posterior MI with 2° AV block, type I (Wenckebach). 72-year-old nursing home resident sent to ER for evaluation of fever. Why is his pacemaker firing at a rate of 125/minute? The pacemaker is firing at a ventricular rate of 125/minute. There is a PVC approximately half-way across the rhythm strip with a compensatory pause which allows you to notice a P wave – and the ventricular pacer follows the atrial activity. This is a dual chamber pacer, which is more physiologic than a single lead ventricular pacemaker. The pacer allows the ventricle to follow the sinus rate during exercise or other situations of appropriate increased heart rate. Rhythm strip – 4th beat is PVC with following compensatory pause revealing P waves with following ventricular paced beats. 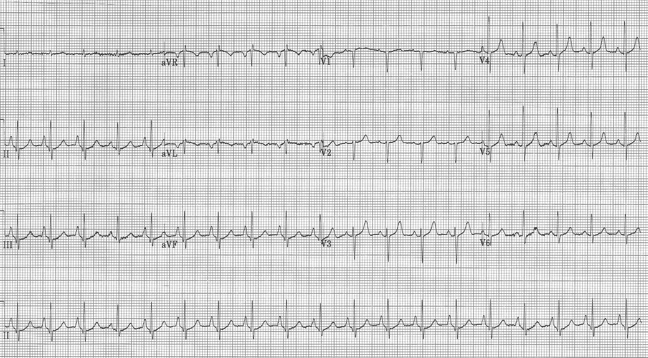 This elder man is febrile and dehydrated – both good reasons for sinus tachycardia at 125/minute. Appropriate treatment of this pacemaker-mediated tachycardia is fluid resuscitation and acetaminophen! 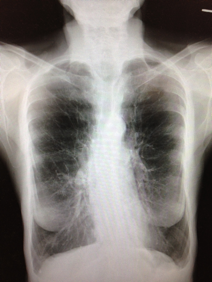 70-year-old woman with dyspnea. What diagnosis belongs on her problem list? This is an excellent example of EKG changes of COPD. Note the impressive changes of emphysema: flat and depressed diaphragms and the “vertical” heart.